The third season of Star Wars Rebels hits blu-ray and DVD on Tuesday, kicking off an exciting week of Star Wars releases concluding with "Force Friday II" and the release of the first wave of merchandise for The Last Jedi. While "Force Friday" will attract the greatest attention, the blu-ray box set for Star Wars Rebels season three should not be overlooked because it is far and away the the best one that Lucasfilm has released for the series. Season three of Rebels was, in general, a significant step up from season two. It will be remembered for re-introducing Grand Admiral Thrawn to the Star Wars canon, and a lot of this season’s success can be credited to that decision. The cat and mouse game between Thrawn (brilliantly voiced by Lars Mikkelsen) and our heroes gave this season a sense of scope and importance that was lacking in season two. On top of that, in-depth exploration of Sabine's backstory and Mandalorian culture led to some of the most compelling storylines Rebels has produced to date. Like all TV seasons, season three of Rebels has its highs and lows, but despite its weak points (for some reason the show continues to tell stories with Azmorigan), the good of this season definitely out-ranked the bad. The episodes themselves look great on blu-ray, as expected. The one thing that can always be said about Rebels is that the animation work is really good. While it's not as ambitious as its predecessor The Clone Wars was at times, the show consistently turns in solid visuals. And, to be fair, our heroes visited more planets and locations than in previous seasons, giving audiences a greater sense that there is something larger at play in the grand scheme of the galaxy. But odds are if you're thinking about buying the box set, you've already seen the episodes, in which case what will really entice you to buy the box set is the bonus features. After a disappointing box set for season two that featured almost no bonus material, Lucasfilm seems to have listened to the fans and has filled season three’s set with more features than ever before, including featurettes and episode commentaries. 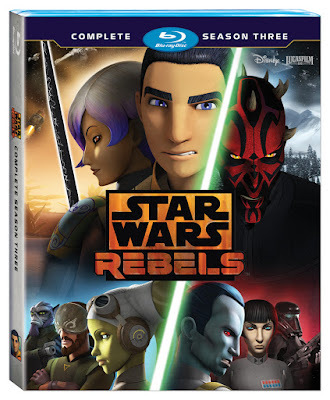 Rebels Recon is also included in every episode, but those have been available on YouTube since the episodes aired. Let's start with the audio commentaries. This is something I’ve always wanted to see for episodes of Star Wars animation ever since season one of The Clone Wars, so I was thrilled to learn that we would finally be getting them in this release. There are commentaries for five episodes, three of which ("Legacy of Mandalore", "Through Imperial Eyes" and "Double Agent Droid") feature Dave Filoni (Executive Producer), Justin Ridge (Supervising Director), Kilian Plunkett (Art Director), Keith Kellogg (Animation Supervisor) and Joel Aron (CG Supervisor: Lighting & FX) all watching and commenting on the episodes together. Two more episodes ("Trials of the Dark Saber" and "Twin Suns") feature Filoni’s solo commentary. All five commentaries are fun and laced with interesting tidbits about the making of the show. The group commentaries generally feature more insight into the technical side of things, like animation, lighting, and editing, while those by Filoni alone focus more on the story telling and broader thematic issues of the episodes. Dave Filoni is one of the greatest Star Wars minds there is, having learned directly from George Lucas himself over almost a decade of work on The Clone Wars, so it is a real treat to hear him reflect on specific episodes as they play out. Also included in the box set are five featurettes covering Maul and Kenobi, Mandalore, Saw Gerrera, Thrawn, and the Rebellion as a whole. What struck me about these is how much time was spent in them previewing the coming season. The Saw Gerrera and Thrawn featurettes in particular almost felt more like extended previews for season four than behind-the-scenes looks at season three. I'm not saying this a bad thing, but it wasn't what I was expecting. There are some great moments in the featurettes. It’s great to see author Tim Zahn find out that a character he created (Thrawn) would be appearing on the show and then hear him offer some suggestions to the Rebels crew. Filoni also talks about some cool behind the scenes information for fans of The Clone Wars, revealing for example that George Lucas actually wrote Pre Vizsla's speech about the history of the Dark Saber in the season two episode "The Mandalore Plot". And anytime you can get voice actor Sam Witwer to break down Maul's character is a treat for Star Wars animation fans. Overall, this is the best Star Wars Rebels blu-ray release to date. Sure, there could always be more (commentaries for every episode! ), but considering how much of a step up in value this set is over last season, it's hard to complain. And what we get is actually very good. The commentaries are informative and fun to listen to, and the featurettes take us behind the scenes and give us a sneak peek at what's to come. Not to mention that the episodes look fantastic, and the late-summer release leaves time to do a season three rewatch before the final season begins airing this fall.